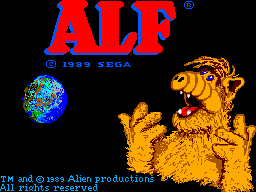 Everybody knows Alf- he's that 229 year old, furry lovable alien life form from the planet Melmac. He's everywhere....and unfortunately he's now on the Sega master system. You play as Alf in this platform exploration game trying to fix his spaceship in order to get back to mars to see his girlfriend Rhonda. I've only just recently played this game because I wanted to know what it was like...is it really as bad as everyone says? The first words that spring to mind when playing this game are 'ZX' and 'Spectrum'. The gaming is just so basic and it can be frustrating, you only have to come the slightest bit close to an enemy to be instantly killed. By reading the back of the box you might be fooled into thinking you're in for a massive adventure - but you're very much mistaken as the game takes ten minutes to finish, it's a very small game. 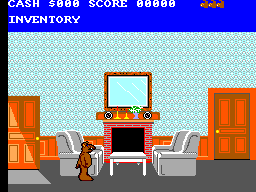 These graphics are some of the worst you'll ever see on the SMS, in-fact some of the worst you'll see on any console full stop. 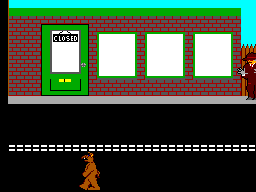 The animation is terrible, for example watch Alf as he walks up the basement stairs and watch him momentarily disappear when you turn directions. The backgrounds are poor and that's being nice. This is the games best feature and it's still nothing to boast about. There are no sound effects but the music is bearable...only just. The controls weren't too bad however button 1 is jump and for the majority of SMS games you have to use button 2 to jump, so maybe that could've been switched around but the game has no options at all. In terms of responsiveness I have no complaints. You may want to play this until you've completed it, but once it is completed you will never return to it. This game is as bad as the reputation it has, and I was foolish enough to find out for myself. It looks and plays like a spectrum game and must have been thrown together within a day. When you see the credits at the end you'll see that only eight people worked on the game, or maybe only eight people had the bottle to own up to contributing to this game. If you're an experienced gamer it can be difficult at times but if you're a beginner you don't stand a chance. It's the worst game on the SMS or definitely in the top three anyway.